We divide décor fabric into two main categories: drapery fabric and upholstery fabric. But that doesn’t mean drapery fabric can’t be used for upholstery and vice versa. And of course there are a whole lot of other uses for these fabrics, even beyond décor. 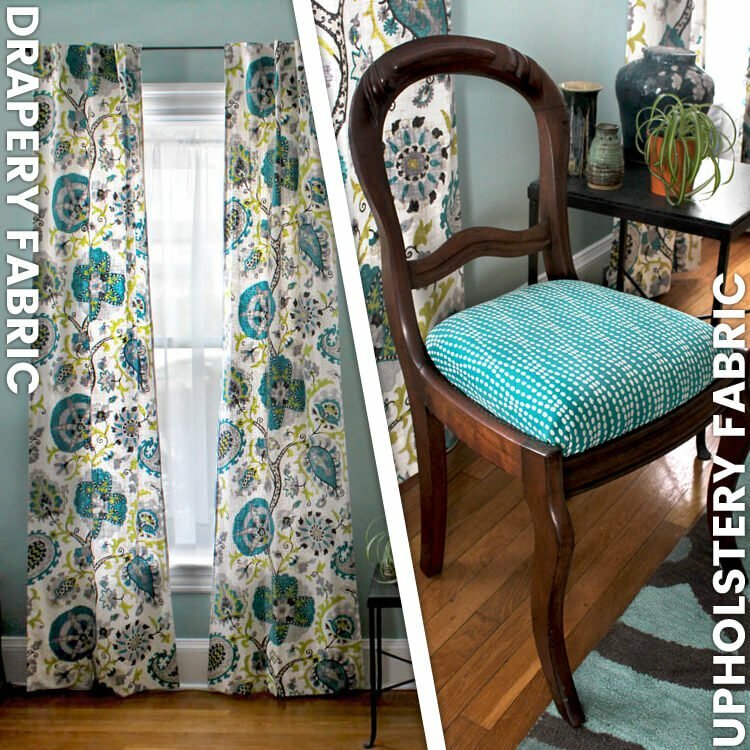 In this article, we’ll explain the differences between drapery and upholstery fabric, what you can use them for, and what double rubs means. Drapery fabric is a medium weight fabric that’s also referred to as multipurpose fabric. It’s heavier than quilting and apparel cottons, but lighter than upholstery fabric. Sheer drapery fabric is lightweight and shouldn’t be used for upholstery. If drapery weight fabric has a pattern, it’s usually printed on the fabric. Designs can also be embroidered. In general, it’s made of cotton, linen, rayon (natural cellulose fiber), or a blend that can include polyester. It’s used in a wide range of projects, including curtains, valances, roman shades, throw pillows, accent chairs, dining chairs, headboards, ottomans, duvet covers, wall art, and accessories like handbags. Upholstery fabric is heavier, thicker, and stiffer than drapery fabric. This gives it a more substantial feel, though it doesn’t always mean it’s more durable than drapery fabric. The patterns of upholstery fabrics are created when the fabric is woven. Different colored yarns are used, which means the pattern goes all the way through and won’t wear away like printed fabrics can. One way to tell if the pattern is woven is to look at the back of the fabric where you’ll see the inverse of the pattern instead of blank fabric. Solid upholstery fabrics can also have raised textures and patterns, like matelassé fabric, that are also created in the weaving process. Upholstery fabrics can also have backings, which you’ll often see on solid fabrics like velvet, chenille, and vinyl. These fabrics with backings are stiff and not recommended for drapery. Other upholstery fabrics may be suitable for heavy, formal draperies. If your upholstery is going to get very heavy use, upholstery fabrics are the best choice. Couches, armchairs, and other upholstery you sit on will usually get the most wear and tear. A good indication of durability is how many double rubs a fabric has. The Wyzenbeek test is the standard for measuring double rubs. It tests the abrasion resistance by rubbing back and forth on the fabric until 2 or more yarns break or until there is noticeable wear. One double rub is roughly the equivalent of sitting down and getting up from a chair once. The higher the double rubs, the more resistant to abrasion. Commercial standards are higher and you’ll often see fabrics with double rubs over 100,000 for “contract” fabric. Though many of our drapery weight fabrics are over 15,000 double rubs, we don’t always recommend them for use on very heavily used upholstery like family room couches and chairs. 30,000+ is extra-heavy duty and may be best for these sorts of applications. Another factor that can affect what fabric you choose is how easy it is to reupholster your project. For example, it’s easier to replace the fabric on dining chairs and removable cushions than fully upholstered couches and armchairs. So while they may both be heavily used, you may be fine with a drapery fabric for dining chair seats because even if it wears out, it’s easy to reupholster. Double rubs isn’t the only factor in a fabric’s durability. The fiber content, weave, and finish also affect its longevity. Upholstery fabrics are often made from synthetic fibers like polyester and acrylic or are blended with natural fibers. These synthetic fibers tend to make fabric last longer. Certain weaves are more durable than others. For example, a twill weave is stronger than a plain duck weave. Décor fabrics also have different finishes that may make the fabric resistant to stains, mildew, mold, or UV light. Outdoor fabrics are durable because of their fiber content and finish, and are popular both inside and outside. They’re great for spaces with kid and pet traffic and rooms with high humidity like bathrooms. How you care for fabric is also important for longevity. Dry cleaning is recommended for most décor fabrics, but if you want to wash your fabric, read Can I Wash Décor Fabric? for more information. The bottom line is you don’t have to be confined to only upholstery fabrics for your upholstery project. Medium weight drapery fabrics are suitable for many upholstery applications. At least 15,000 double rubs is best for upholstery that gets regular wear and tear. When in doubt, we always recommend ordering a sample (when available) to get a good sense of the weight, color, and feel of the fabric. Shop our décor fabric to find the fabric that's right for your project. What is 11-ounce Belgian linen suitable for? BEST ANSWER: The 11 oz Belgian linen is great for a variety of home decor projects, like throw pillows, upholstery, duvet covers, and heavier draperies. How do you Match patterns of drawn drapes in the center? BEST ANSWER: It would depend on the pattern so I don't know of a specific way to do this. Fold under the fabric the amount needed for the hems then continue to fold under more fabric on the inside edges until the two pieces match up. what is 'multi upholstery drapery' fabric? BEST ANSWER: Many home decor fabrics are considered multipurpose meaning they can be used for drapery, upholstery, and many other decor projects. Which is better for a chair: 100%polyester or polyester/rayon blend? I love toile which I have used on draperies and throw pillows. What/which toile would be best for a high back chair? I was thinking of the Bosporis, but not sure. BEST ANSWER: Covington Bosporus would look lovely! With 12,000 double rubs, this fabric is appropriate for upholstery with light to medium use.